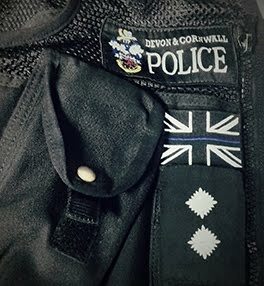 Inspector blogging: I still hear voices. Thank you. I still hear voices. Thank you. What a great combination of words. I know they are often used to refer to those catchy little ditties we hear on daytime radio shows, and which wiggle their way deep into our consciousness. And I am so sorry if "The Birdie Song" has unexpectedly popped in to your otherwise well ordered thoughts. However, "ear worm" has a different connotation for me and quite possibly others too. I hear my ear worms on Airwave police radio speakers or the secret service style ear buds that I wedge in my ears. I used to use chunky headsets with cotton covers that made my ear sweat. Not anymore. I wanted to write about ear worms because this week is the first week for a long time when part of my daily routine will not involve swallowing a bitter tasting Sertraline pill. I was rather concerned that the "not real" voices I used to hear in the dark old days would come back. They haven't. And the mere sound of chatter on an Airwave police radio that had started to make my chest chill with anxiety, well that has returned to an almost comforting noise. It makes me feel part of something, again. The familiar voices that make the chatter have returned to being my ear worms; ear worms I understand and know how to live with. No matter what I am doing, If I hear Airwaves chatter it touches my ear drum and gets instantaneously conducted to whichever part of my consciousness and unconsciousness that is trying to keep track of where everyone is, what they are doing, what nasties are out there and what I should be doing etc etc etc. So, I still hear voices, but they are technologically as opposed to psychologically conjured out of thin air. That's good. And now to say thank you; thank you to a really rather amazing group of people. These are the people who are there with you during every painstakingly dull moment of a long shift, working with you in every rushed and confused journey to an incident when information is flying around like a flock of startled birds, whose spirit is alongside you every time it has well and truly hit the fan and they are working magic to make sure you are not the only one it is flying towards. Some people call them "Gold". These are the Radio Dispatch Officers(1) and Control Room Staff who spend their shifts in one of the most incredibly high stake, multi screen, non-role playing strategy "games" I have ever seen. And do you know the most amazing thing? Well, actually there are two amazing things. The first is that they sound phenomenally calm and controlled under the inhuman levels of stress. The second is that they keep doing it; keep coming in to work; keep guiding "the blue line" to where it is needed and doing their very best to keep those on the line as safe as they can be. PS - the snow makes the little winding lanes even more slippery, and also makes it even more important to look after each other and each other's property. (1) - the computer calls them Resource Deployment Officers, but what does the computer know! I asked a friend in Gold to read this (and they did - thank you...). This what they said "when I manage a radio terminal, they are my ‘little family’ for the duration, and I feel personally responsible for each and every one of them. I sometimes get annoyed when the proactive officers don’t tell Comms what is going on, as I don’t feel capable of keeping them safe". I hope you don't mind me sharing.